Mechanical pruning reduced labor costs by 90%, resulted in increased grape yields and berry quality was as good or better than hand-pruned vines. 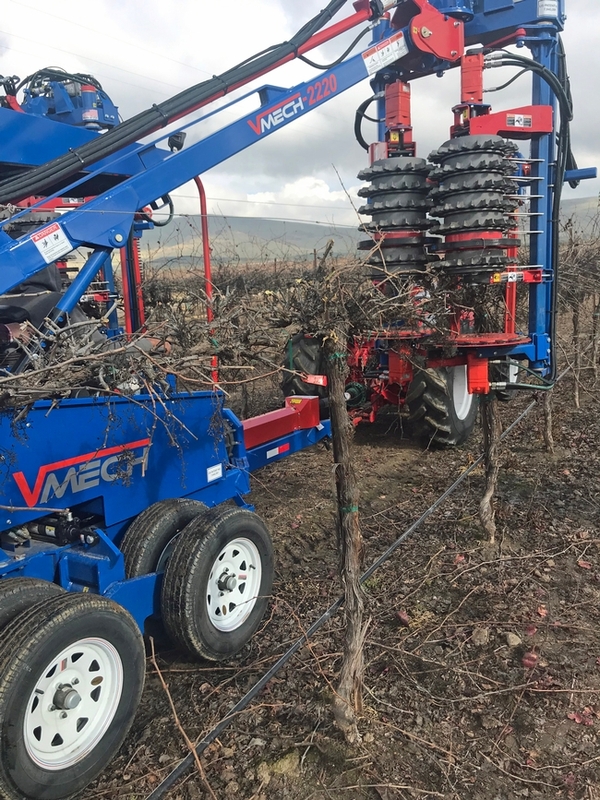 Wine grape growers in the San Joaquin Valley who want to switch from hand pruning to mechanical pruning won't have to replant their vineyards to accommodate machinery, according to a new study published in HortTechnology by University of California Cooperative Extension researchers. Instead, growers can retrain the vines to make the transition, without losing fruit yield or quality. Mechanical pruning reduced labor costs by 90%, resulted in increased grape yields and had no impact on the grape berry's anthocyanin content. That's welcome news for growers because the cost of re-establishing a vineyard in the region is roughly $15,600 per acre. The research was conducted in an 8-acre portion of a 53-acre, 20-year-old Merlot vineyard in Madera County. After completion of the research project, the grower converted the rest of the 53-acre vineyard to single high-wire sprawling system. Many other wine grape growers have followed suit. The Wine Group, which manages 13,000 acres of vineyards across Central California, is establishing new vineyards and converting old vineyards for mechanical pruning and suckering, said vineyard manager Nick Davis. Davis, who works closely with Kurtural and the UCCE viticulture advisor in Fresno County, George Zhuang, said the company greatly values the UC Cooperative Extension research that is guiding the changes. 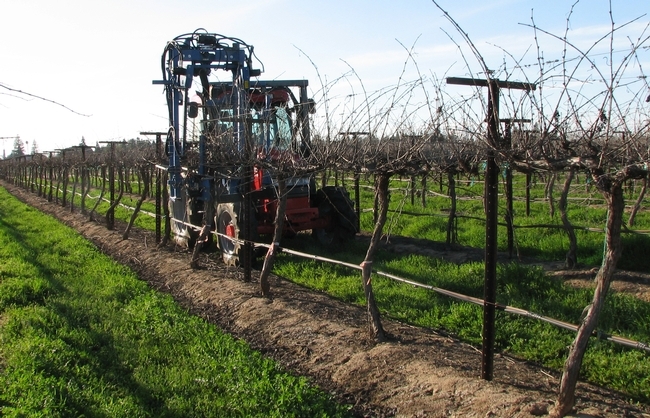 A bilateral cordon-trained, mechanically box-pruned single high-wire sprawling system proved to be the most successful system for mechanical pruning in the San Joaquin Valley. More than half of all California wine grapes are grown in the San Joaquin Valley. Worker shortages, rising labor costs, low returns and occasional droughts are driving wine grape growers to seek innovative ways to sustain their businesses. 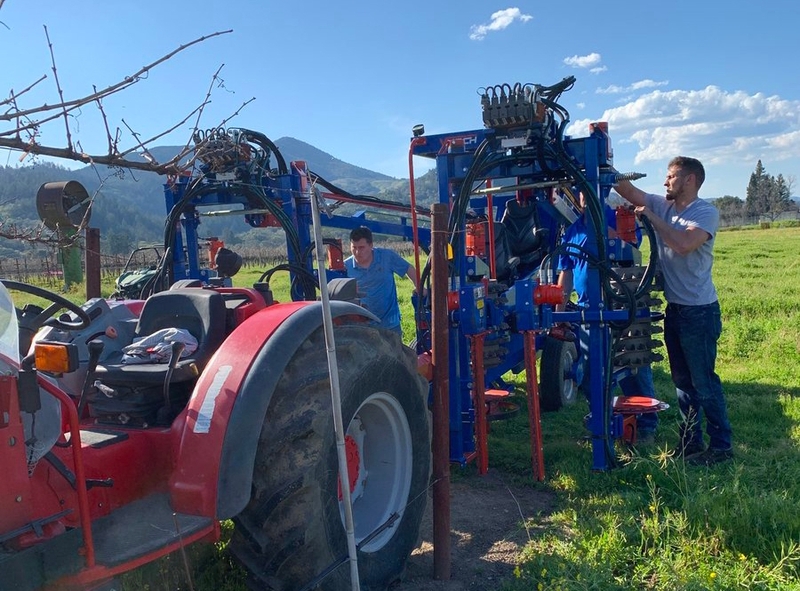 “To help growers maintain the profitability of their vineyards, we're studying the use of machines to reduce the number of people needed to perform tasks like pruning,” Zhuang said. “Because the canopy architecture and yield characteristics of mechanically pruned vines are different from vines that are hand-pruned, the water and fertilizer requirements for the mechanically pruned vines can be quite different. So we are studying the yield and fruit quality of grapes produced on different rootstocks in mechanical pruning systems in the San Joaquin Valley,” Zhuang said. 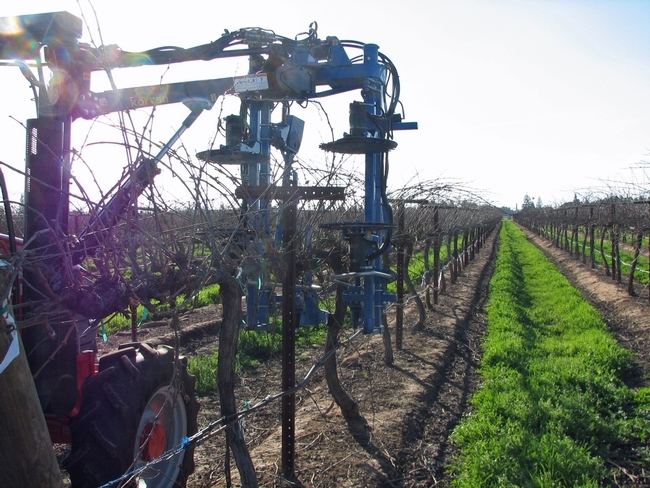 UC scientists are studying the use of machines for pruning to reduce the number of people needed to maintain a vineyard. The Madera field study was conducted for three consecutive seasons in the hot climate conditions typical of the San Joaquin Valley. In this area, traditional vineyards are head-trained to a 38-inch-tall trunk above the vineyard floor and two eight-node canes are laid on a catch wire in opposite directions and two eight-node canes are attached to a 66-inch high catch wire. Although this traditional training system can work for mechanical harvesting, it doesn't accommodate mechanical dormant pruning and shoot removal with limited success in other mechanical canopy management operations. To accommodate mechanical pruning and shoot removal, the vines were converted to a bilateral cordon-trained, spur-pruned California sprawl training system, or to a bilateral cordon-trained, mechanically box-pruned single high-wire sprawling system. The latter option proved to be the most successful system for mechanical pruning in the San Joaquin Valley. UC Cooperative Extension advisors and specialists to discuss considerations for mechanically pruned grape vineyards. On Feb. 19, San Joaquin Valley grape growers are invited to discuss the latest UC research on mechanical pruning, trunk disease and rootstocks with UC Cooperative Extension advisors and specialists in Fresno. Growers will also get to observe a field demonstration of grapevines being mechanically pruned. “We have been hearing from California grape growers that they are having a hard time finding enough workers to maintain their vineyards and increasing labor cost starts challenging grape-farming economic sustainability so we are studying the use of machines to reduce the number of people needed to perform tasks such as pruning,” said George Zhuang, UC Cooperative Extension viticulture advisor for Fresno County. Gabriel Torres, UC Cooperative Extension viticulture advisor for Tulare and Kings counties, will discuss plant diseases that may result from trunk injuries and pruning wounds from the machinery. Karl Lund, UC Cooperative Extension viticulture advisor for Mariposa, Merced and Madera counties, will discuss how to select rootstock for a vineyard that will be mechanically managed. A field demonstration of mechanical grapevine pruning will follow the research discussion. Kaan Kurtural, UC Cooperative Extension viticulture specialist in the UC Davis Department of Viticulture and Enology, will go over the basic principles of mechanical pruning of wine grape vines. From 8 a.m. to 10:30 a.m., UC Cooperative Extension advisors and specialists will meet with growers in a Golden State Vintners vineyard at 7409 W Central Ave in Fresno. “We will discuss current grape issues and the future of viticulture in the valley,” Zhuang said. The meeting, which is being co-hosted by UC Cooperative Extension and San Joaquin Valley Winegrowers Association, is free. For more information, contact Zhuang at gzhuang@ucanr.edu or (559) 241-7506.